Allied Roofing Services offers a 100% guarantee on all of its commercial roofing services, including commercial roof repairs. Whether you need a roofing subcontractor to repair a commercial roof made with specialty products or the more common materials on the market, we have you covered. As a fully licensed, bonded and insured roofing subcontractor in the greater Chicago area with a 100% satisfaction guarantee, we will check off the boxes as the ideal hire for your commercial roofing job. Safety is our number one priority. All of our workers are OSHA-trained. We consistently follow regulations and we provide our team with the safety equipment needed for our commercial jobs. Allied Roofing Services offers commercial roof repair services for everything from minor wear and tear to severe leak damage. We have thermal diagnostic services available to detect the presence of leaks in commercial buildings. 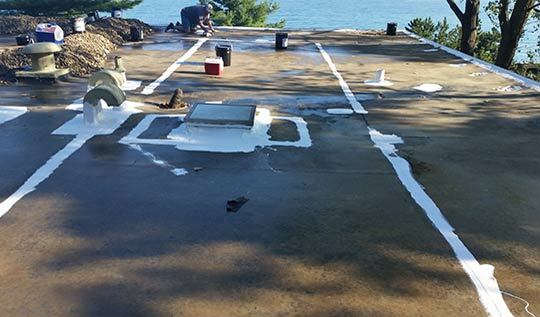 When you need additions and adjustments made to your commercial roofing project, such as caulking, re-roofing and repairing penetration to fix leaks in the roofing system, we get the job done right the first time. When we repair a commercial roof, we provide an estimate and our professional recommendations for a course of action. This includes suggestions for preventing similar damage in the future. Our preventative maintenance programs help you preserve your commercial roof so that that it is long-lasting, strong and resistant to future damage. With our client’s best interests in mind, we provide you with suggestions that will save you time and money in the long run. If you are in need of emergency repair services, we are readily available to take your call. From diagnosing the source of the problem to providing a comprehensive plan for repair, you will receive quality service every step of the way.